The dog and I negotiated the least painful position for carrying her out to pee. She told me in growls and snaps: "Do not put pressure on my back legs." With her head relaxed against my shoulder one day, I thought she needed a name. "Mabel" came to mind. I whispered the name in her ear. It seemed to fit. 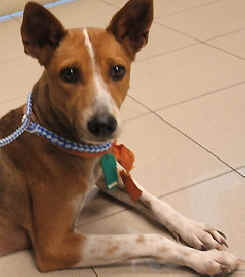 She is a "Thai Soi Dog Mix," maybe a bit beagle with the fawn-like build and pointy ears of a Basenji. Rescuers found her on a bridge over floodwaters with a dislocated pelvis, possibly from swift debris as she paddled to higher ground. The dog cried out in pain. She couldnâ€™t move much and would have died from starvation and dehydration if not found. I met the skeletal girl in Thailand with Kinship Circle for animal flood aid. She stared through crate bars into a crowded flood shelter. Her eyes followed volunteers who walked, fed, watered, medicated and cared for hundreds of animals. Her chart said "dislocated pelvis" and "do not walk." Her thin body revealed an asymmetrical pelvis. A Thai veterinarian manipulated her head of femur bone back into its socket. But it quickly dislodged. She endured chronic pain. Soon I noticed "Mabel" penciled in over the ID number on her chart. And so, Mabel she became. Love comes in many forms. People prefer to compartmentalize it as romantic, parental, maternalâ€¦ The love between a human and nonhuman animal is often marginalized. How then, can it be so powerful? I donâ€™t know exactly when I began to love Mabel, but do recall that I gave her extra walks and slipped her a Thai tea cookie at bedtime each night. When in the field on food and rescue runs, we sometimes returned to the shelter late at night. I worried about Mabelâ€™s bedtime ritual amid tired volunteers craving food and showers. Everyone wanted to get the dayâ€™s rescues settled and head back to the hotel. Meanwhile, I scrounged for tea cookies in the dark. Eventually I kept some in my pocket at all times. During my last few days in Thailand, I noticed Mabelâ€™s face brighten. The listless look gave way to an alert countenance, as if she finally saw a chance for something better in her hard life. When I approached, she got all wiggly and waggy-tailed. On departure day, Iâ€™d planned to stop by the shelter on the way to the airport. I never made it. Business matters â€” a driver and lodging for incoming teams, funds for the rest of the deploymentâ€¦ â€” stole every minute. We had to leave or risk a missed flight. I felt unusually sad. In the last two years, Kinship Circle has deployed to Chile, Brazil and Japan. We always align with a local rescue group for international animal aid. In Thailand, we worked with SCAD (Soi/Street Cats and Dogs of Bangkok) Foundation and Save Elephant Foundation. These folks are among the nicest, most sincere, skilled and devoted weâ€™ve met anywhere in the world. And very funny. Lots of laughs and bonding. It keeps you going. So I assigned my tears to all the leaving â€” Mabel, new friends and colleagues, the disaster itself and so many more animals in need. I cried from Bangkok to Hong Kong. Then I realized: I miss Mabel. Too much. A second thought occurred to me: My husband will go ballistic if I bring a seventh animal into the home herd. So I waited until his plane headset blocked sound and phoned Matt, SCAD Operations Director and head of the flood shelter. "Matt, I am in Hong Kong and really sorry we couldnâ€™t stop by for goodbyesâ€¦Is Mabel okay? Has she asked about me?" I blubbered. "You know," Matt replied, "SCAD does adoptions to the states all the time. Itâ€™s very possible." In that moment on the tarmac in Hong Kong I knew one thing. When love is real, take it. Corny, yes, but valid nonetheless. If I fell for every animal encountered as an animal rights activist and rescuer, Iâ€™d be a hoarder. Caring for four dogs, three cats and a young son while running Kinship Circle is intense. But Mabel isâ€¦well, Mabel. A tiny heart from the other side of the world â€” a love I cannot live without. Sister and Mabel departed from Suvarnabhumi Intâ€™l Airport in Bangkok on a typically hot, sunny day in Thailand. At their first layover in Narita, Japan, an earthquake shook the ground, perhaps an aftershock from the 7.0 quake here on New Yearâ€™s Day. After the longest in-flight stretch, Sister greeted groggy Mabel to go through customs at Chicago Oâ€™Hare Intâ€™l Airport. Then Mabel experienced a first-ever: A blast of frigid, wintry air. Fortunately, SCAD Foundation sent a fleece-lined doggie vest decorated with an Australian flag, General Manager Wendy Edneyâ€™s home country. Mabel is so fashion-forward! By 6:30 that evening, Kinship Circle director Brenda Shoss and her son Elijah eagerly waited for Sister in baggage claim at Lambert-St. Louis International Airport. Several sandwich cream cookies were stashed in Brendaâ€™s pocket. Not the exact Thai tea cookies, but close enough thanks to Three Dog Bakery. About 20 minutes after Sister arrived, Mabel was wheeled in from United Airlinesâ€™ freight area. Was she disoriented by a rush of new smells, sights, sounds? Elated to hear Sisterâ€™s familiar voice? Surprised to see Brenda? Whatever the reason, Mabel began to scream. A skinny, screaming Thai dog in a giant pink bow (courtesy of Sister in honor of Brendaâ€™s birthday). Mabel and Kinship Circle director Brenda Shoss greet each other at the airport shortly after Kinship volunteer Sister Michael Marie arrived with her from Bangkok, Thailand. People gathered as Brenda explained, "She is from Thailandâ€¦Never seen America or felt cold weather before nowâ€¦rescued from a bridge over floodwaters." Ah, onlookers nodded, as if this were cause to shriek. Brendaâ€™s vet believes she is part Basenji, a breed with unique vocalizations but no bark.